This cake is grown-up’s version of a giant Easter egg. 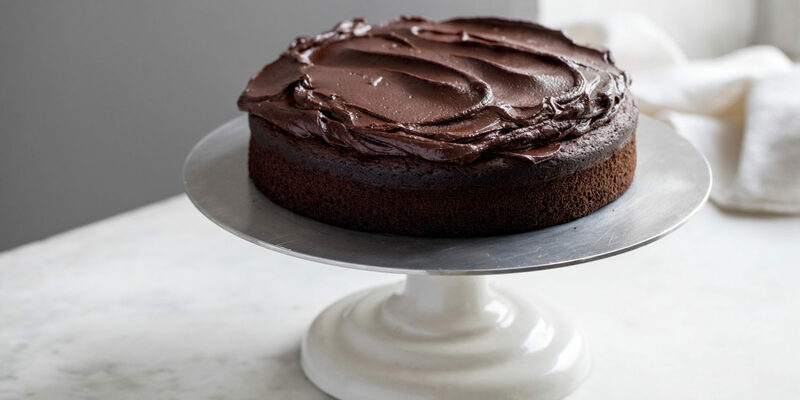 Baking this chocolate cake is key to ensuring you feel completely guilt-free this Easter & truly revel in breaking your Lent. It’ll also win you some serious brownie points among the chocoholics in your life. This cake guarantees endless joy, happiness and unashamed third helpings! It’s flourless, contains no refined sugar, and is positively bursting with good fats, antioxidants, and, of course, deliciousness! Cacao in its purest form is rich in essential minerals and antioxidants. It’s also one of the best food sources of magnesium – and we all know how essential magnesium energy production, for a healthy brain and nervous system, and of course for our muscles to repair. Coconut is also a nutritional powerhouse; it even contains a type of fatty acid (MCT) that our bodies readily burn as energy rather than store as fat. Plus it’s super easy to make, great for those guests who are gluten, dairy or nut intolerant, and is guaranteed to go down better than any Easter egg you’d buy. So unleash your inner chocoholic that’s been in hibernation for the last 40 days, treat your body and your taste buds to this Easter winner! Line a 9-inch spring form cake tin with greaseproof paper and preheat your oven to 170 Celsius. Boil the water and sift the 6 tablespoons of raw cacao into a jug or bowl. Whisk in the ½ cup of hot water and vanilla extract, and then continue to whisk until the mixture is smooth but quite runny. Then leave to one side to cool a bit. In another bowl, whisk together the coconut, baking powder and salt. Then, taking the jug/bowl with the chocolate mixture, whisk in the melted coconut oil and eggs, and after about 1 minute of whisking, add the dry ingredients from the other bowl. Whisk the mixture together for about 2 more minutes until it has a texture of thick cream. Now take the bar of dark chocolate and grate it – using the larger side of your grater – and fold these shavings into the mixture. Next pour the batter into the lined tin and pop it in the oven for no more than 30 minutes – the top should be cracking a bit but it should still feel very moist and springy to the touch. Let it cool completely in the tin while you make the ganache. Melt the chocolate with the coconut milk in a bain-marie over a low heat until smooth. Add the arrowroot starch (to give it a glossy look), stir well, and then, using a spatula or a pallet knife, smooth it onto the cake. Grate the dark chocolate and sprinkle toasted coconut flakes on top. Leave it to set completely before slicing up and enjoying with a dollop of coconut yogurt, cream or ice cream for ultimate indulgence.